When you talk about your library budget, it is easy to point out that funding has decreased while prices for library resources are going up. It can be much more effective, though, to actually compare past and present library budgets using per capita inflation-adjusted dollars. Thanks to an online Library inflation calculator developed by Joyce Chapman, our colleague at the State Library of North Carolina, that is now easy to do! 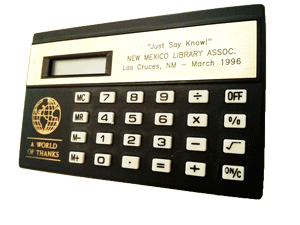 “The calculator lets the library choose a historic year and input a historic monetary value (state aid, local revenue, any money related to running a library) and then input current day monetary value to compare. Optionally, a library can input their service population for the historic and current time periods. The calculator then provides the inflation-adjusted dollar value of historical data, the percentage change that has occurred during the given time period in inflation-adjusted dollars, and this same percentage change in per capita inflation-adjusted dollars,” says Ms. Chapman. To use the Library inflation calculator, visit http://plstats.nclive.org/library_inflation_calculator.php.